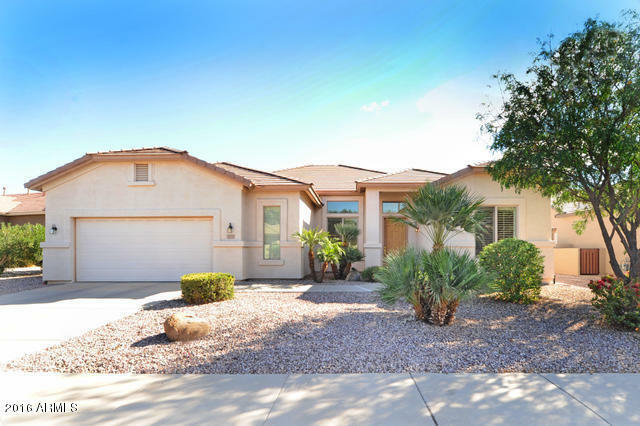 Enjoy stunning mountain views on the golf course in this gated active adult retirement community. Spacious living with three bedrooms and three baths and lots of windows offering spectacular views from the kitchen, family and master bedroom. Entertain with the separate living and dining room or in the spacious family room and kitchen. Or, take the party outdoors with the covered extended patio. Large neutral tile and carpet cover the floors and plantation shutters cover the windows. Newer stainless appliances in the kitchen with updated corian counters, a pantry and lots of cabinet storage. The master suite offers a separate shower and tub, dual vanities and a large walk in closet. One bedroom is being used as an office and the other guest bedroom is split from the master. MORE Enjoy the 2.5 car garage with added storage and the laundry room with built in cabinets. This home is well maintained and move in ready! What's not to love about this beautiful home with spectacular views and resort amenities such as golf, tennis, fitness centers, library and so much more!